Since 2015, Threshold has been pioneering Housing First with its pilot project focused on providing housing and support for women ex-offenders, an extremely complex cohort of people with multiple needs. Throughout the project Threshold has worked with the University of York to evaluate the service, learning vast amounts about Housing First as a model and women’s unique journeys into and out of homelessness. The findings of the University of York study and the anecdotal evidence gathered by the staff, and volunteers who have been involved in Threshold’s Housing First service have been key to helping Crisis put together their implementation report. Other providers featured in the report include St. Mungos, Inspiring Change, Turning Point Glasgow and Sheffield Housing First. 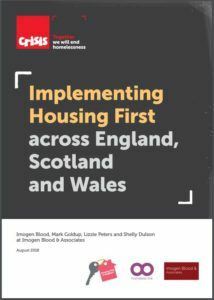 The Crisis report therefore stands as an implementation guide for organisations to learn more about what Housing First means, what challenges it presents, how best to put it into practice and what can be expected of staff, volunteers and commissioners. Throughout the report it cites findings from Threshold’s Housing First service for women ex-offenders and its service for survivors of domestic abuse, holding them up as shining examples of how effective the model can be for not only getting people off the streets, but addressing the root causes of homelessness, addiction, abuse and mental health issues. If you would like to know more about Threshold’s Housing First service, please feel free to get in touch on housingfirst@thp.org.uk or call 0161 626 0844.